Are you super-tempted by the scent of Cinnabons wafting through the mall, as I am? Or is it ice cream? What about popcorn (order me a large at the cinema, please!). A treat is OK, but why can’t I just stop at one? What stops us from feeling FULL? Why must I always want MORE? What makes us want another, and another, and another, whether it’s a cappuccino or a whiskey? When your #1 love language is TALK, it’s the thread that winds its way through your whole life. You’ll always remember their words. “That’s what he said to me, that one time.” Or your mother’s words to you, harsh from stress, or the way your neighbor spoke to you the first time you were an “adult.” Words, and what they meant. That’s the thread. Spiritually, words are active, not empty. You’ll recall that God created the heavens and the earth with words, with voice. The speaking made the ideas real. When your love language is TALK, you react and — can I say it? — you OVER-REACT to words, the words that people say to you, and even the words that people SAID to you, 20 years ago. You carry them with you, and they have become real in your body, as much as God’s words made the oceans, the land, and the birds. Unkind words that register in your body create “psychic holes.” Empty spaces. A vacuum. You might have heard, “Nature abhors a vacuum,” and that means: something will rush in to fill that up. In my case, it was often alcohol. Sometimes food. Sometimes mindless scrolling on the internet. Anything to fill that feeling of emptiness that was the crater of the bomb of the unkind words they spoke to me. Do you carry words around with you? It’s the unhappy words, right? Rarely the kind ones. So. How can you finally let go of your addictions and your constant sense of not having enough? You can re-language yourself. Careful, now. Re-languaging has to tell the truth. It would be a straight-out lie to say, “I have enough money,” if the ATM says, “This account is empty,” and I see zero coins and notes in my wallet. So it’s not going to work to lie, nope. Re-writing our life script must focus on the big truths, about our path and our progress. If you lie to yourself, you’ll just feel worse. If you can tell the truth and hear it, and believe it, you can fill up those empty craters so you don’t have to use other things or people to do it for you. Today’s video version of “Using the Love Language of Talk for Entrepreneurs” might seem superficial after that deep spiritual stuff. But it’s still relevant. When a customer feels loved, she’ll trust you more and she’s more likely to not only buy from you once but also come back and also refer you to others. When you watch this video you’ll hear how I explain Talk as a Love Language for entrepreneurs. 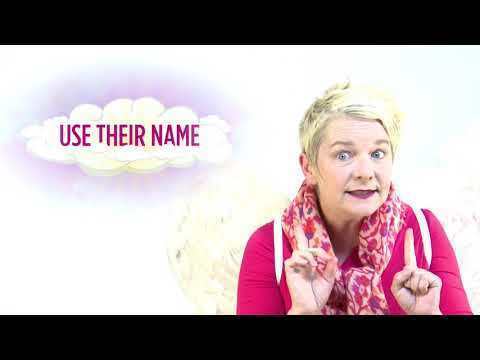 I’m playing the role of “Your Business Angel” on the web tv channel My Big Startup. What caused Miss Pink to get so emotional? “Everything Shannon said was right on point / I said to myself / Shannon delivered a message / ” WORDS. Also known as “the love language of talk!” Words made Miss Pink think to herself and then open up to her divine guidance. Wishing you feelings of deep satisfaction, healing from any addictions, and meaningful connections with your loved ones!